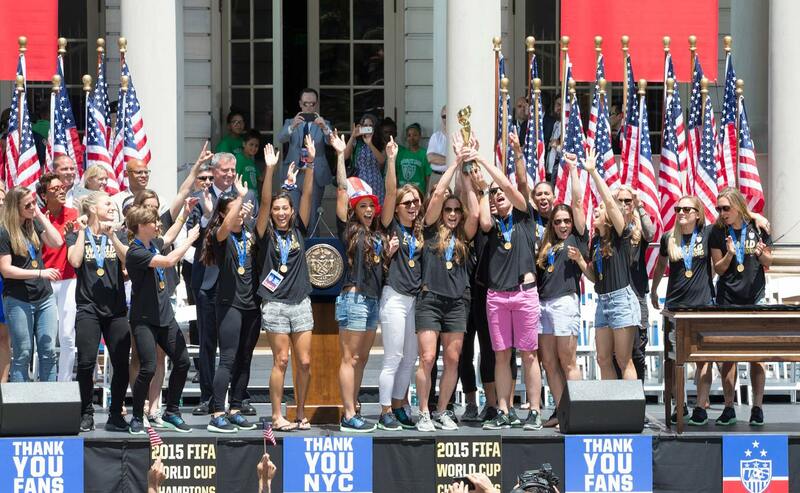 What was it like at the U.S. women's national team's historic New York City parade? 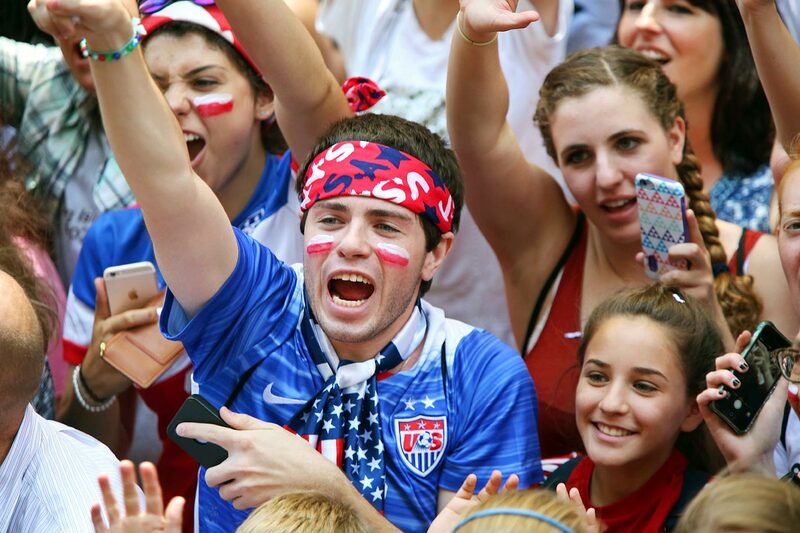 Alexander Abnos shares scenes from the ground and the hope for future as women's soccer faces a seminal moment. 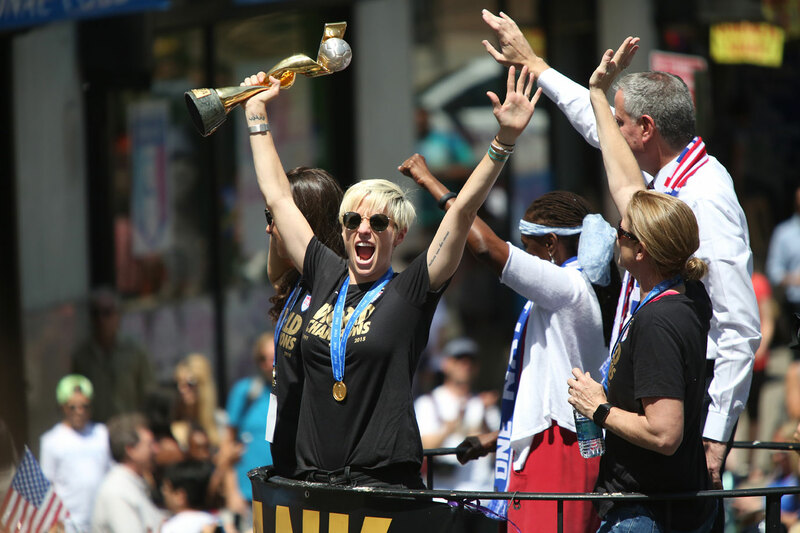 NEW YORK – The United States’ 1991 World Cup-winning team returned home to find that few if any in the general public were even aware that a Women’s World Cup was even taking place at all, let alone that they lived in the country to capture it. The 1999 team accomplished the same feat on home soil, but did so in dramatic circumstances and with Brandi Chastain’s great indelible sports moment providing the exclamation point. Members of the team became celebrities. 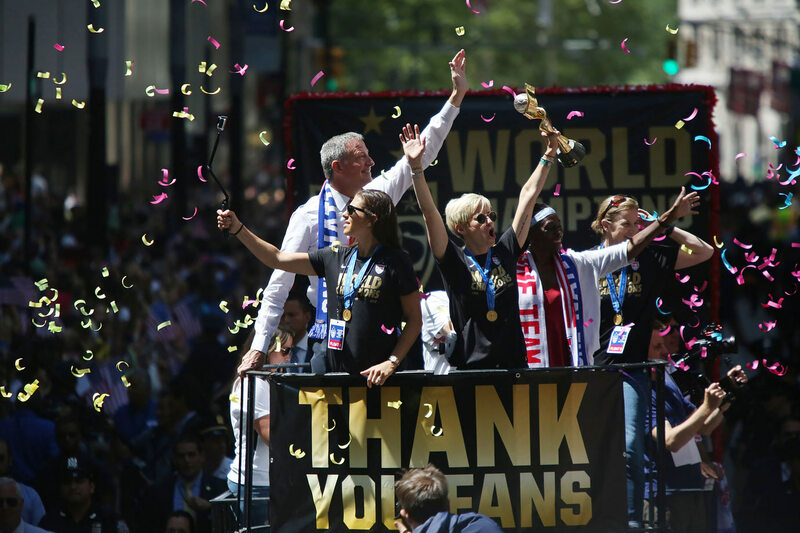 At long last, it begat the creation of the new women’s professional soccer league (the WUSA). But eventually that enthusiasm got quieter, Chastain’s moment became a picture on the wall, and the WUSA folded. 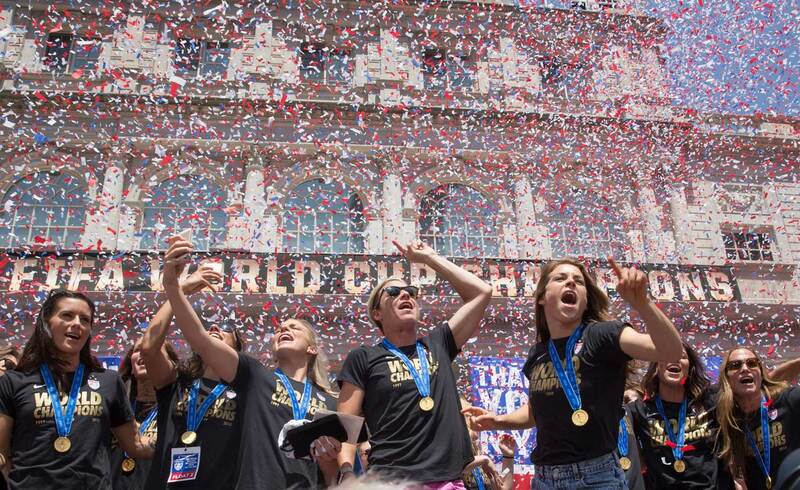 But it makes sense, given the upward trajectory of those previous World Cup-winning celebrations, that the USA's 2015 Women’s World Cup champions would be greeted with unmatched fervor. 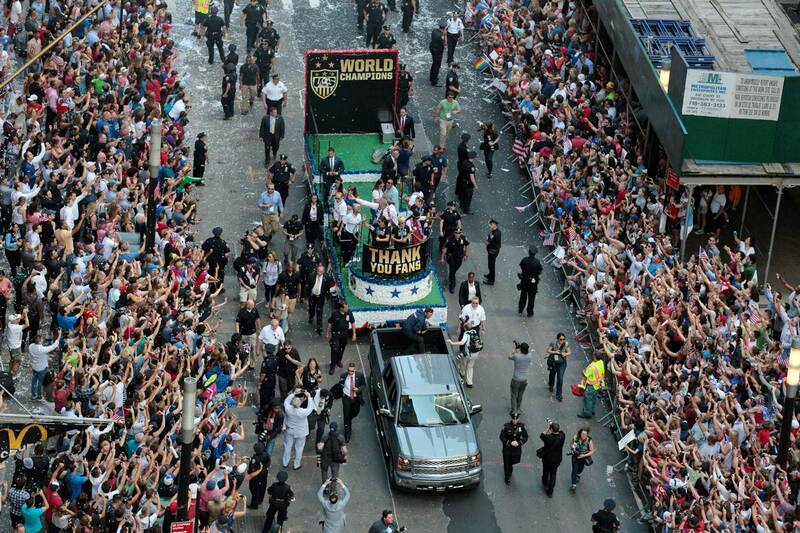 That’s exactly what happened here on a bright and especially warm Friday morning, as thousands of people flooded the Canyon of Heroes in downtown New York for a ticker-tape parade—an honor previously reserved for returning war heroes, heads of state, and famous athletic champions; almost all of whom have been men. 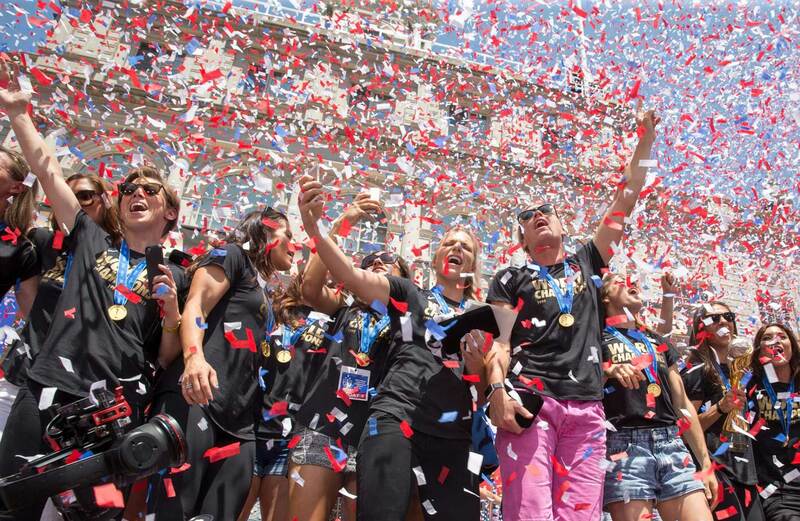 No such celebration celebration had been thrown for a female athlete since 1960, and there had never been one for a team made up entirely of women. Until today. 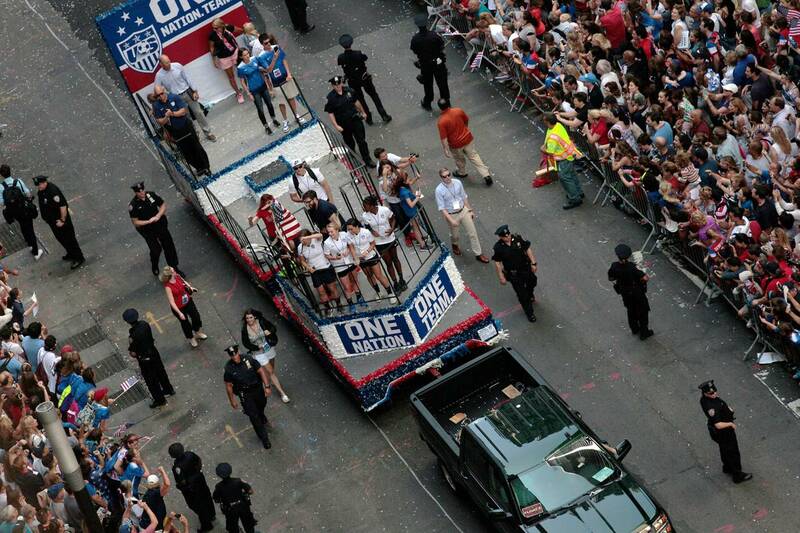 Yet early on in the morning, things hardly resembled what they would become as DeBlasio provided the parade’s climax. At 7 a.m., the sun’s rays hid behind a cover of hazy clouds, leftovers from a rain storm the day before. A cool breeze that would have been more than welcome later on instead came then, blowing the clouds slowly over the extreme southern tip of Manhattan and introducing brightness and heat to proceedings. 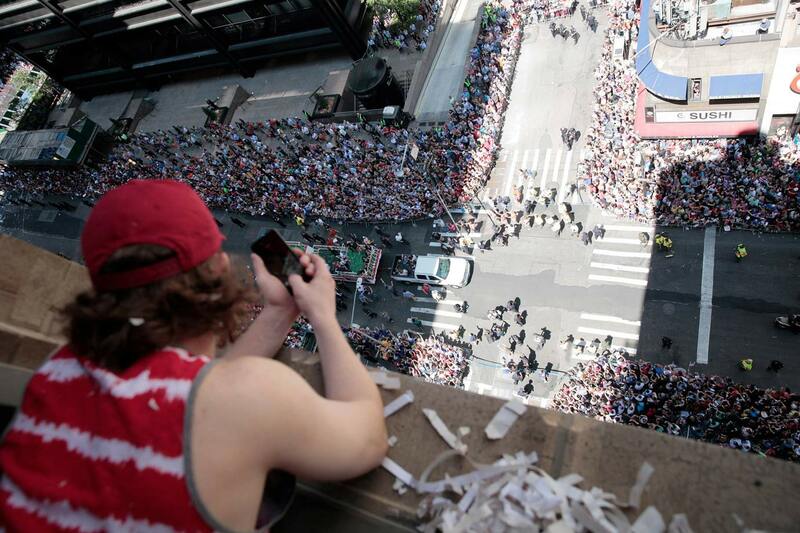 There were barriers along the road near the parade’s beginning, but only a few souls standing against them so early. 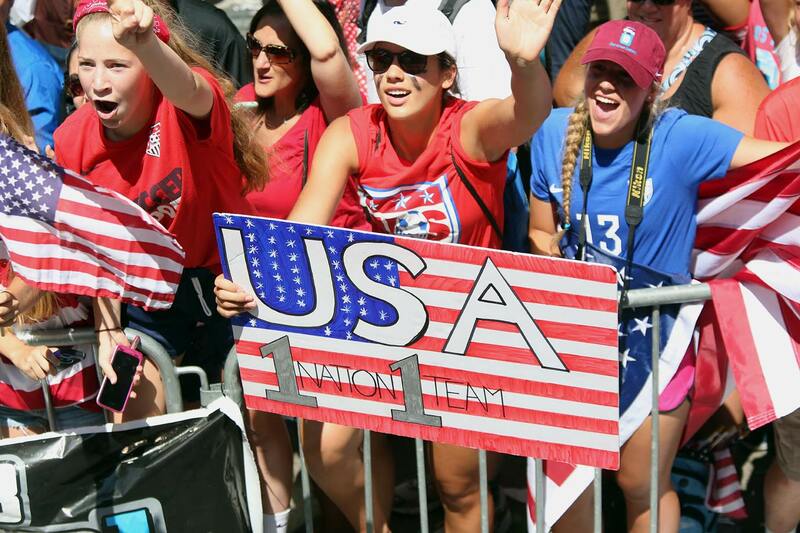 One, 18-year-old Michelle O’Connor, recalled the moment just three days ago when she discovered that the team she had watched obsessively throughout the World Cup would soon share a city and, perhaps, a street, with her. 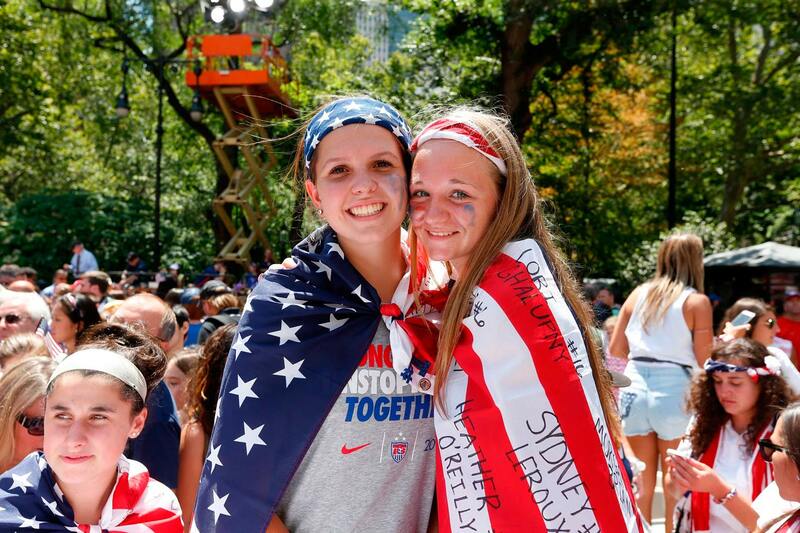 “I saw that Alex Morgan tweeted about [the parade], and I just shot up in bed and said ‘We have to go!’” said O’Connor, who was visiting the city from Tucson, Arizona, along with her brother Christopher, sister Jennifer, and father Andrew. Immediately, at their uncle’s residence where they were visiting, the siblings planned out where they would sit, and when they wanted to get there. 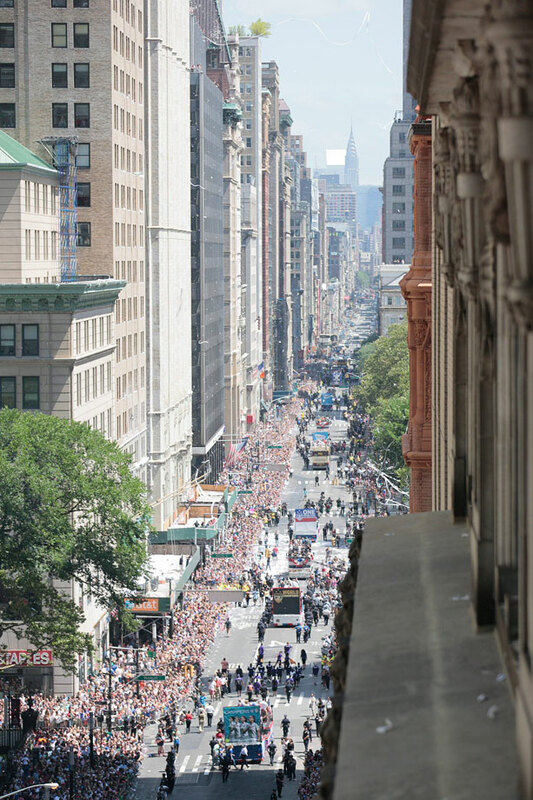 As it turned out, they arrived early enough to get the best seat in the house—first row, right at the start of the parade route. 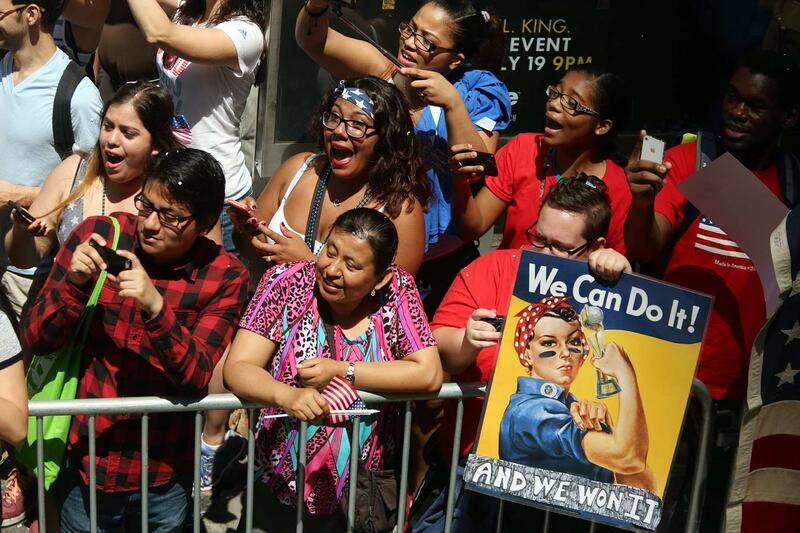 Together, they held signs. 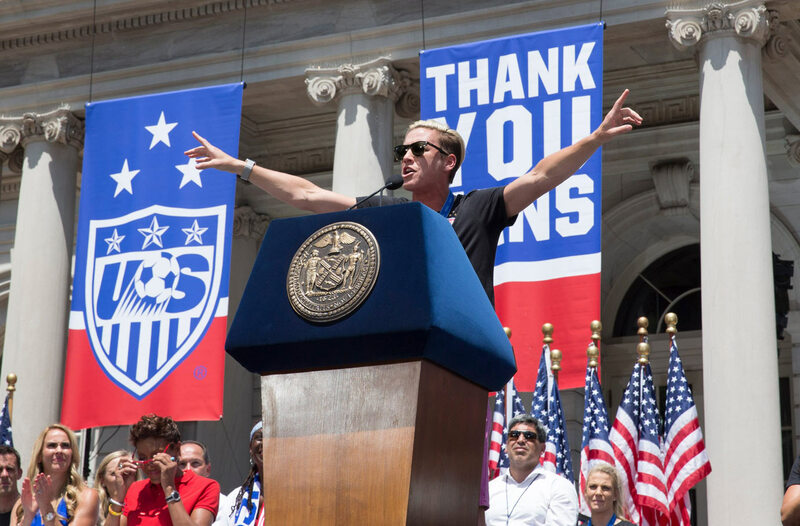 Michelle’s: I love you Tobin. Christopher’s: I HOPE to meet you because I’m SOLO. Jennifer’s: Secretary of Defense, you’re my heroes. 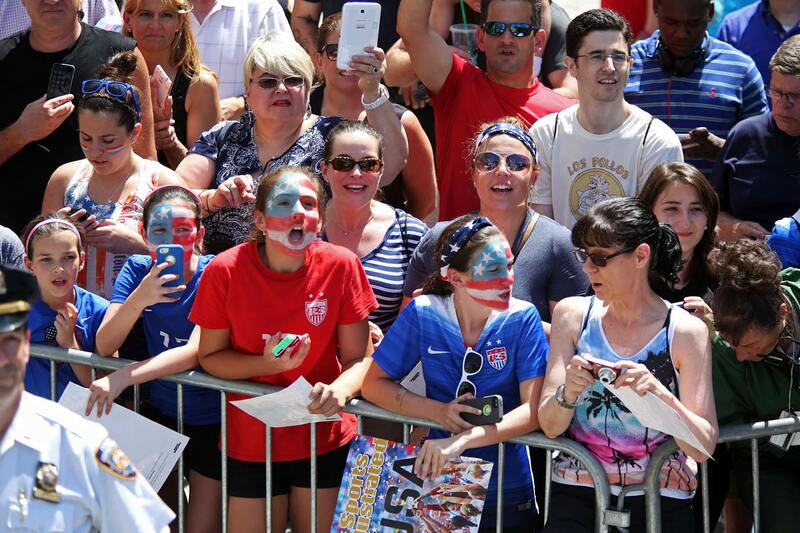 At that moment, the O’Connors’ only company at the beginning of the parade route was Ed Leonard’s family, including 9-year old daughter Caigan, wearing an Alex Morgan jersey with her face painted in red, white, and blue. 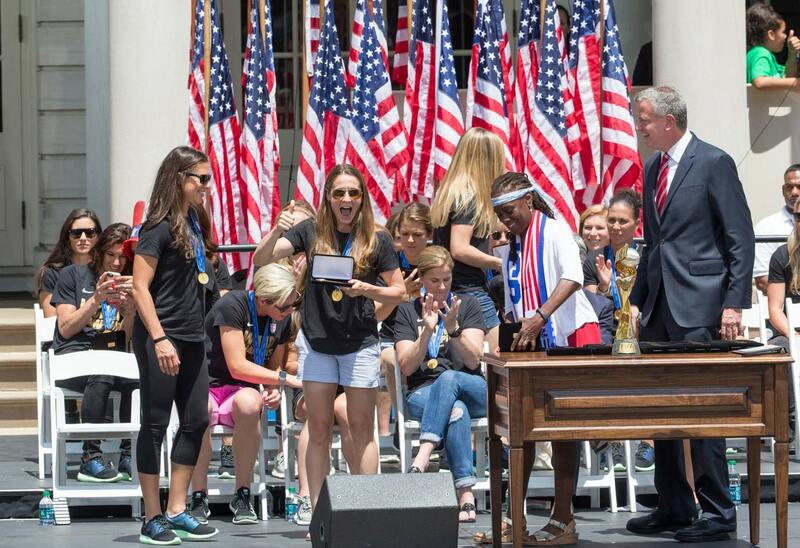 Asked what she would think if a player from the world champions were to look her in the eye and wave from the parade, Caigan’s expression goes wild with bug-eyed wonder, elated at the very thought. She can’t manage words. 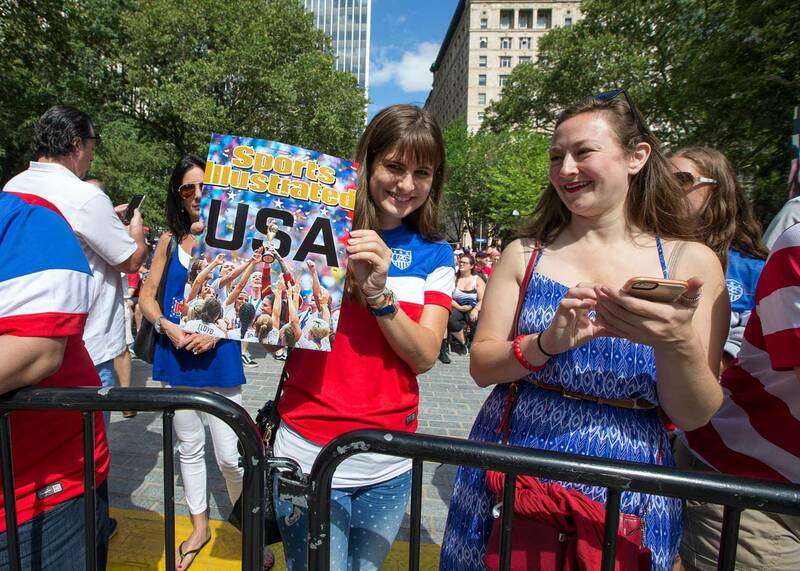 “This event really puts women’s soccer on the map,” says her father. Across the street from the O’Connors, bagpipers played practice runs in a courtyard in front of the hotel where the parade was due to start. 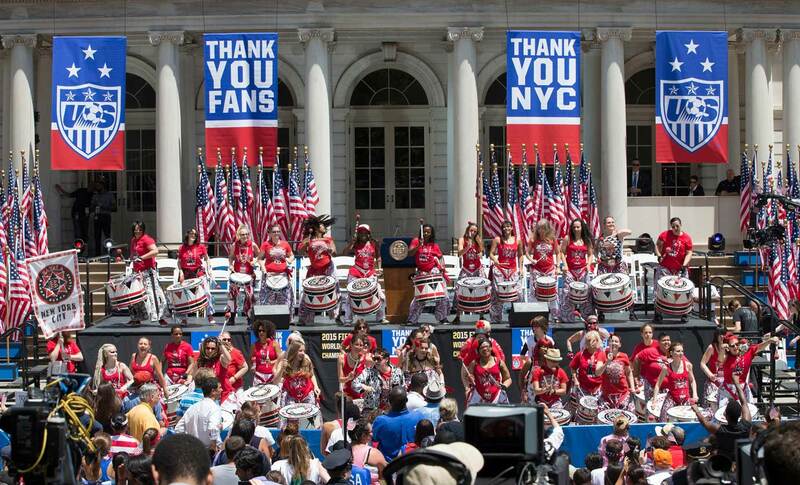 Drummers tuned up their drumheads and ran through rudiments. Vehicles began to line up. 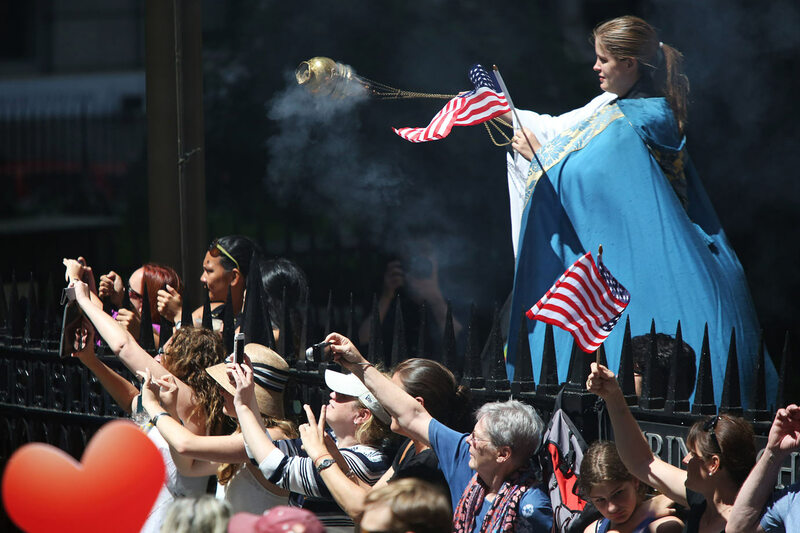 Up the parade route, nearing 8 a.m., a shoe-shiner looked with exasperation as a client sat down in front of the gate of the St. Paul's Chapel. “We might not be able to fit here much longer,” he says. Correct. As time ticked closer to 9 a.m. the streets slowly but surely became a crowded mess. 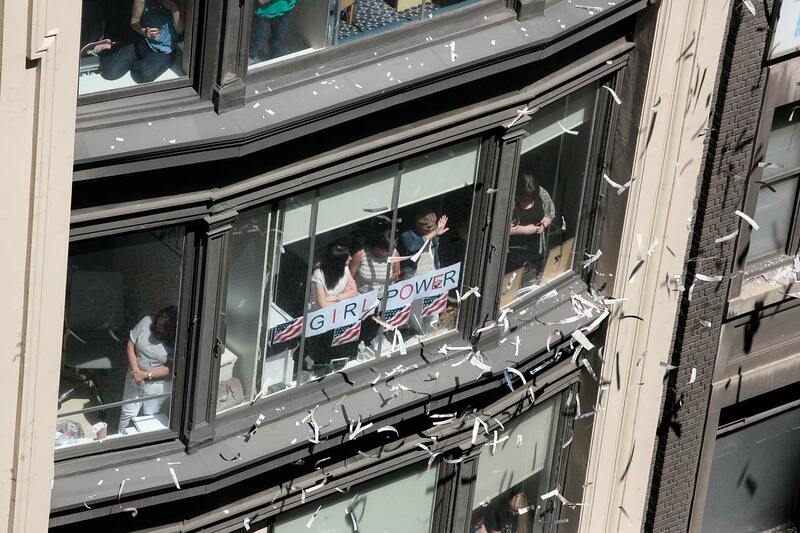 Here’s a dirty little secret about ticker-tape parades: They don’t actually use ticker tape any more. The titular item has been out of use for decades, having outlived its usefulness as a way for stock brokers to quickly read up on the status of the markets. Its more modern equivalent is simple: shredded financial documents. 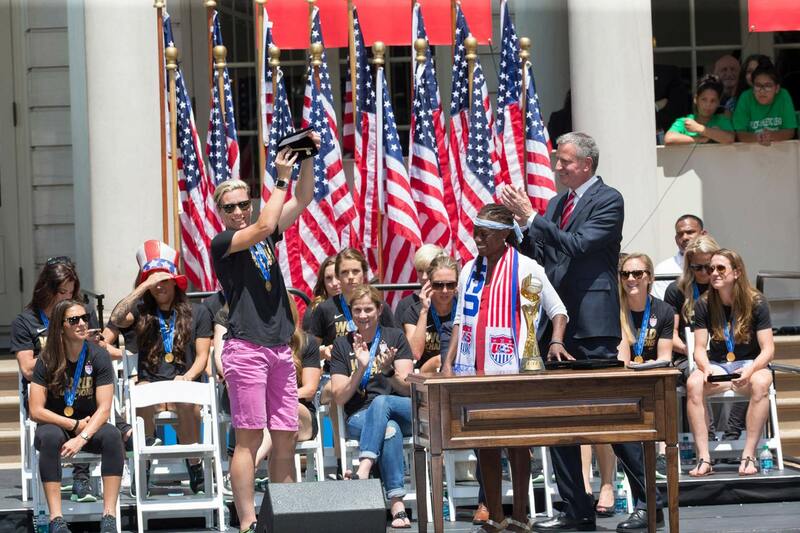 “I actually Googled 'ticker tape,' because I’d never seen one,” head coach Jill Ellis said. 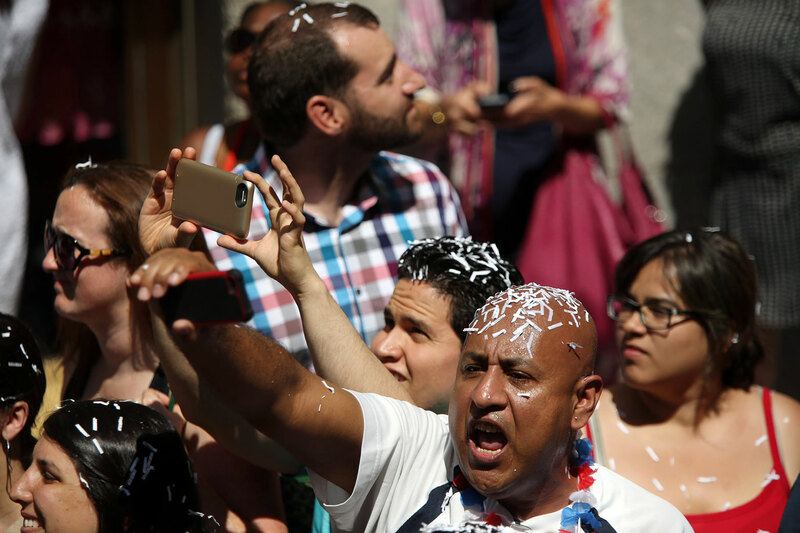 As 9 a.m. approaches, the first of the Wall Street office workers began to open their windows and throw clumps of the improvised confetti from their offices, to the bemusement of those below. Eventually, it would rain paper. 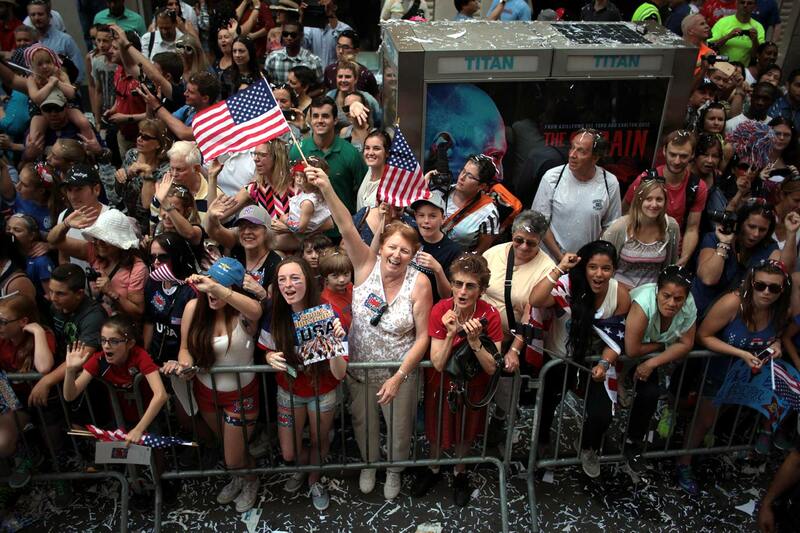 In front of 45 Broadway, the first “U-S-A!” chant broke out. 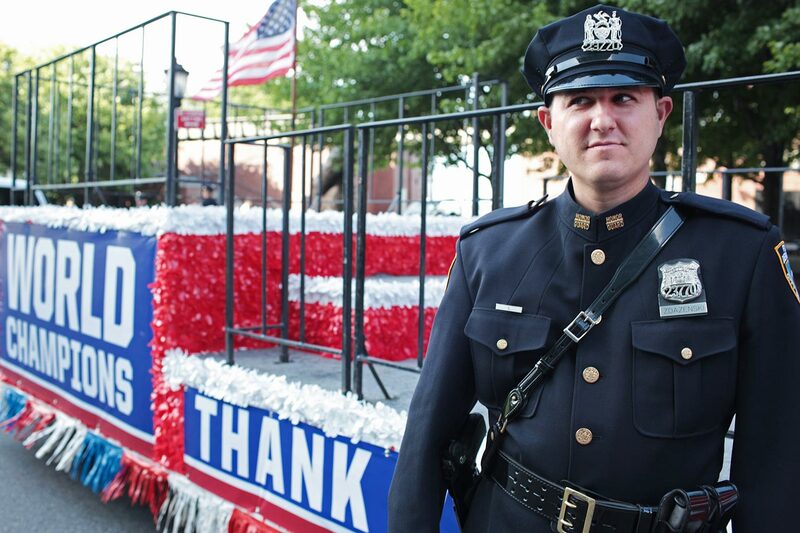 It was directed at a supply truck driving down the now-completely closed off parade route. The driver smiled and waved a small flag at passers-by. The passenger recorded the journey on his smartphone. Just after 9 a.m. at Steve Flanders Square on the immediate outskirts of City Hall, an impromptu version of The Star Spangled Banner began. 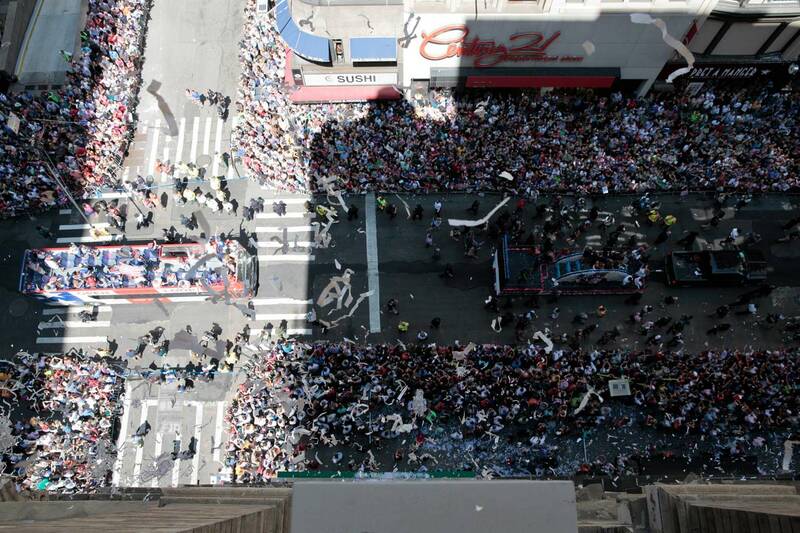 Ticket holders for the post-parade ceremony at City Hall joined in, all in a line that stretched around the block. In a flash, security in front of the Browns announces that seats are available closer to the stage, where mayor Bill DeBlasio and a host of dignitaries later gave speeches. Sean Brown stays put, happy for Mackenzie and himself to be stationed where the players will be entering the ceremony. 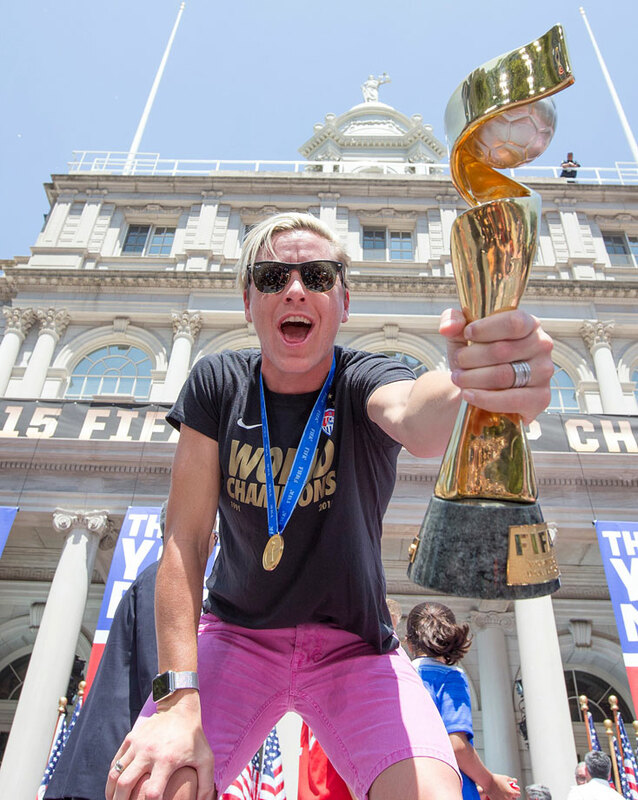 But for all the well-deserved hooplah, the most telling mark of the 2015 World Cup won’t be tied to anything at this event, in this specific place, in this exact time; Just like the 1991 team returning to whispers didn’t begin a downward trajectory for U.S. women’s soccer; Just like the 1999 phenomenon didn’t guarantee future prosperity. Rather, the next step for the sport will come at the local, everyday level. 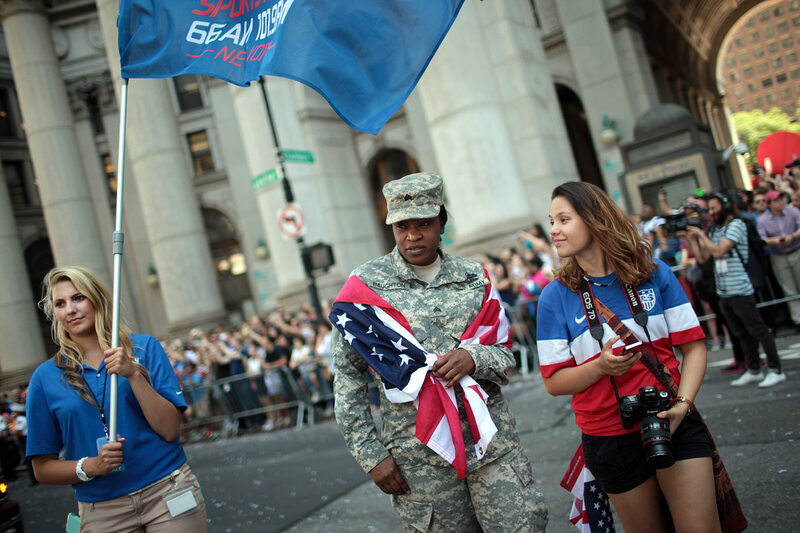 The choice of MLS commissioner Don Garber to represent the professional game at the post-parade ceremony was an odd one, considering that MLS is a men’s league and has not faced the same type of commercial struggles the women’s leagues have. But the words he chose in addressing the crowd carried weight regardless. 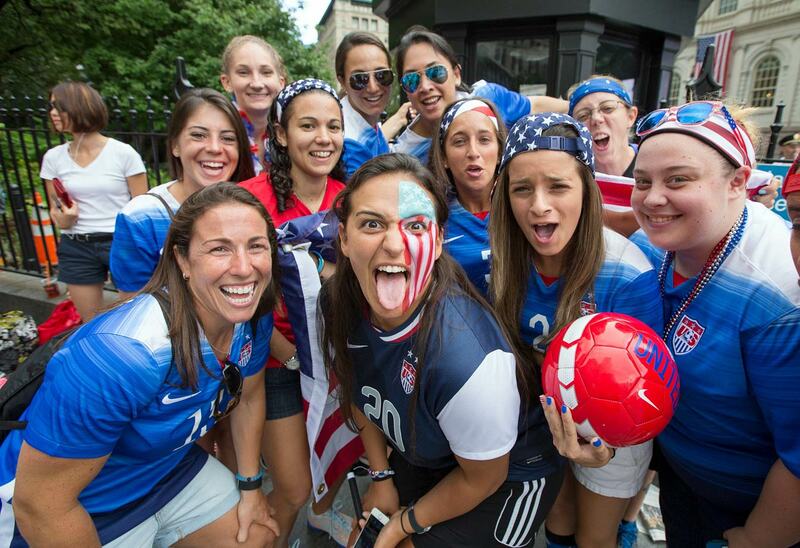 Saturday, across the Hudson River, Sky Blue FC will play Portland Thorns in a National Women’s Soccer League game. 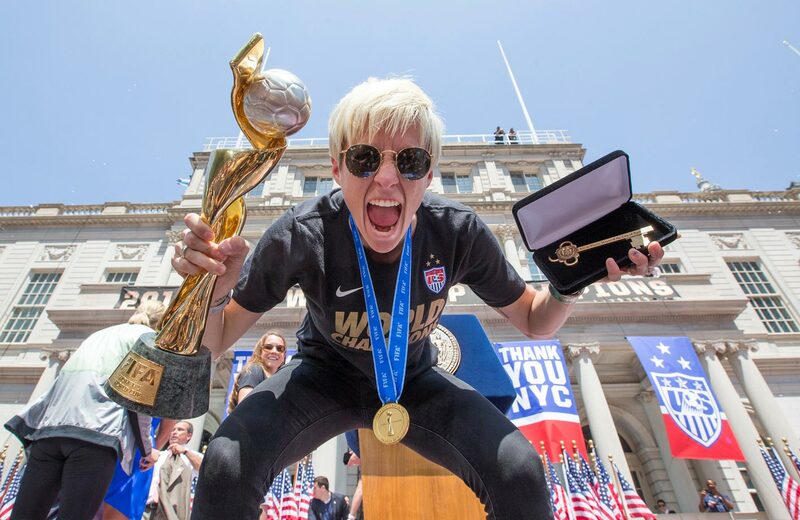 Each team now has two 2015 World Cup winners on its squad, along with several others that played a part in the tournament. 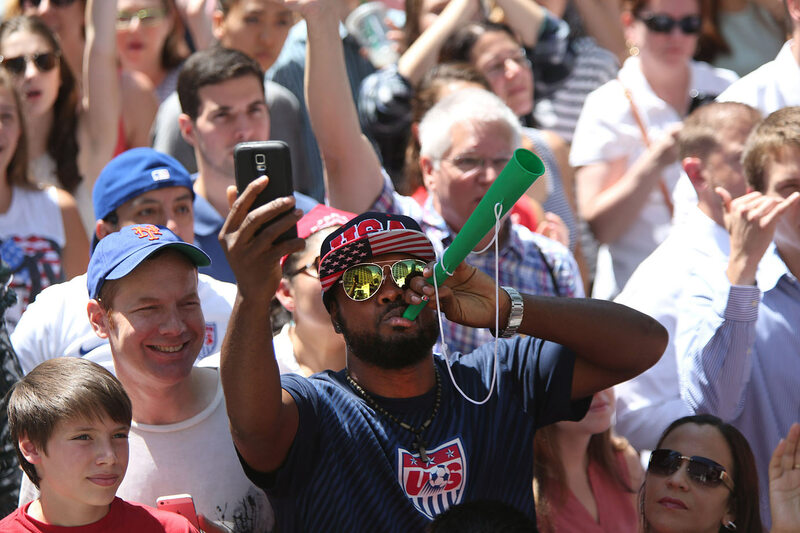 After Friday's festivities and a whirlwind week of press and publicity, perhaps not all players that rode on floats to rapturous cheers, noise, and document shreds will take part in that game. 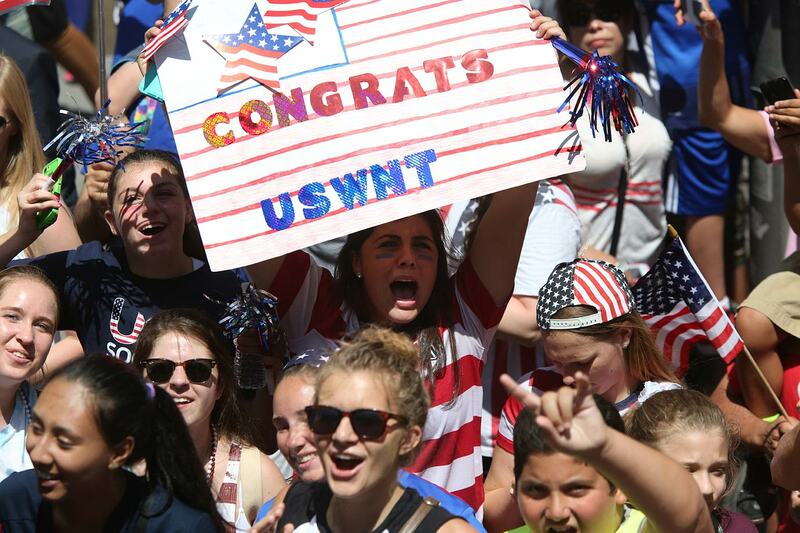 But if the fan support there can reach even a fraction of the enthusiasm shown here, that may say more than any parade ever could. 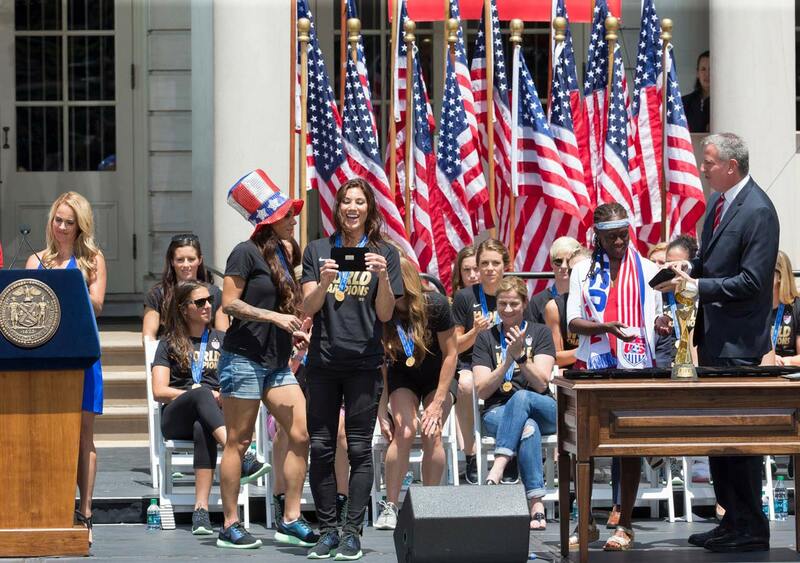 "I’m not sure if we realize right now how incredibly important this was for women’s sports in general," said retiring midfielder Lauren Holiday. 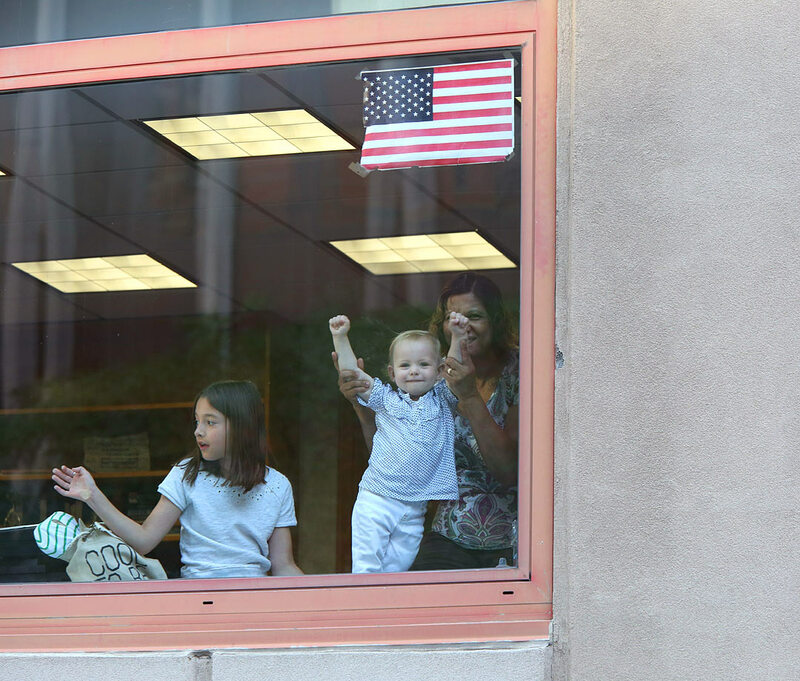 "We’re going to look back on this day and see that it was a defining moment."